Hmm…what’s that?? The newest dog accessory that I need to get for the girls? It’s a cooling neckband thingie. I don’t think my wife was impressed with its effectiveness. Glow-in-the-Dark Dennis? Is that you? mmmm, are there treats up there??? Is that a life preserver? P.S. Tell Dada he can take Survival of the Dead out of his Neflix queue. I didn’t think there was such a thing as a bad zombie movie until after I watched that one. ISH! WOWIE! I’ll bet that collar has super-duper powers! Goodness Dennis, whatever have you round your neck – is that what you have to wear in your house to get treats? 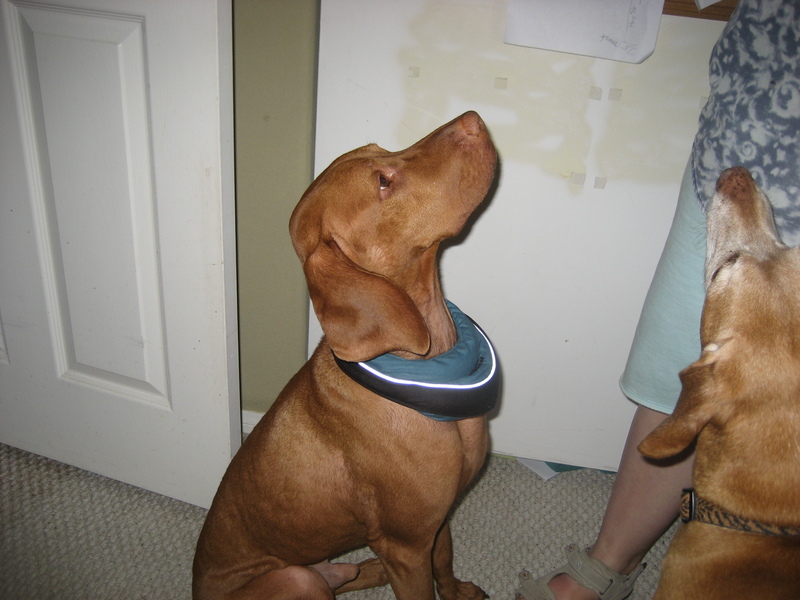 Or perhaps it is a collar for storing treats! Yes, that will be it, you will not longer have to bury your treats for later you can put them in your lovely collar! That’s just your inner brilliance leaking out, right? Looks like you have a crumb catcher around your neck so you don’t miss any of those treats you are waiting for! And the glow in your eyes – does it get brighter the longer you have to wait? What is that neck thing? Did you get treats for wearing it? Yes, Dennis, what is that strange collar round your handsome neck? We like the suggestion it’s for storing treats but we’re wondering how you’d get to them. We know. You’re Dennis the Vizsla and you’d never give up — till the treats were gone. Hummmmm Perhaps you can pass it off to Puddles.. She is a lady of the Cloth you know. The Very Reverend Dennis – has a nice ring to it. Hey Dennis, long time no see. I’m back to blogging and I’m happy I finally got to stop by. If that neck thing works, I bet it helps out with those record temps out in CA!! Hmm…I have something like that and I don’t like it. 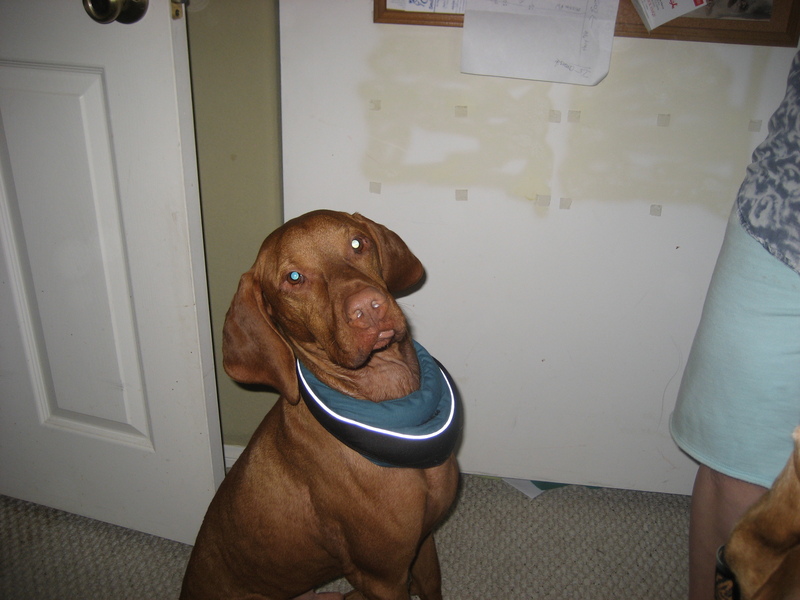 If that cooling neckband thingy is ineffective as a cooling neckband, maybe it will succeed as a combo collar-supperdish. Ah. Been playing fetch with plutonium rods again, I see. Excuse me for being suspicious Dennis but is that one of those “Wedlock” movie exploding collars??? Cool collar. I hope you got a treat, you were posing so nicely! Is that a glow in the dark cone of shame? Good heaven! Dennis, I never realized you had a goiter! He takes the cake at being precious. As long as you get treats…. It’s your fav reeder norweed! I have tons of glow wear too- u will see but where can I can those glowing eyeballs? I think it would drive Makwa nuts “why is this frisbee around my neck?” running around it cicles.